Take a wooden skewers and put the chicken cubes into them. Mix all marinade ingredients and drizzle half the marinade over the chicken. Set it aside for 1 hour. Cut mango in cubes. 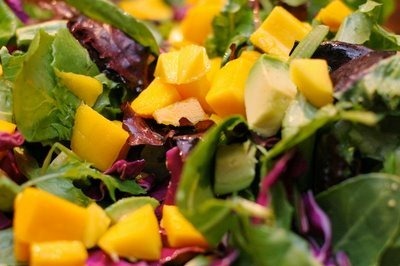 Add red cabbage, cucumber, coriander, spring onions, salt and pepper in mangoes. Pour the remaining marinade mixture over it. Fry the chicken in a pan or in grill for 5-8 minutes or until they are done. Place the salad in a plate and place chicken over it. Drizzle with some olive oil. Serve with your main meal.